We are saddened to report that Dale Adams recently passed away. Here is his obituary. 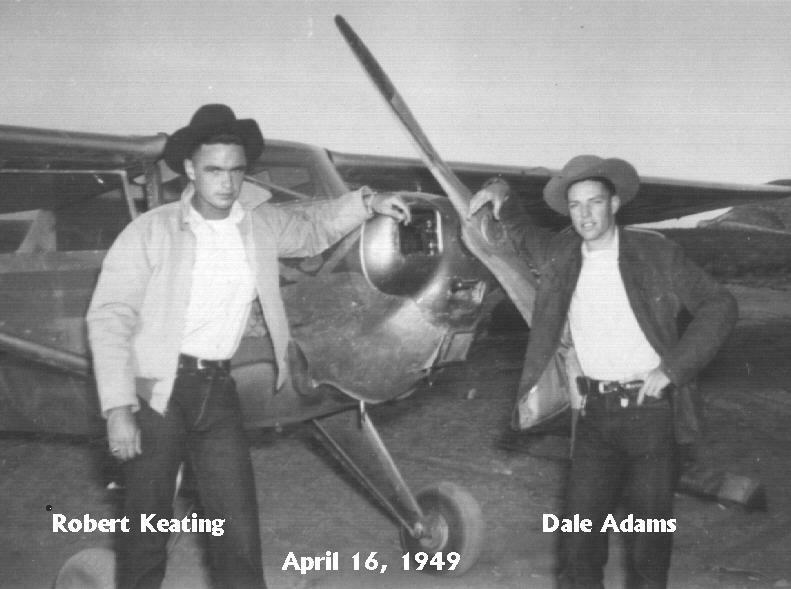 Way back in 1949, Dale Adams, a 22-year-old student at the University of Arizona, and his sidekick, Bob "Jug" Keating, decide to visit Dale's parents for spring break in a rented Luscombe (very small airplane). The complicating factor is that Dale's parents live 1000 miles deep into old Mexico, on a ranch up against the eastern slope of the Sierra Madre Occidental mountain range, in the Mexican State of Durango. Having the sense of immunity that only youth can give, our heroes proceed to scare everybody who knows about the trip, including themselves, about half to death. At the end of the trip, when the Luscombe is returned to the local flying club in Tucson, it is in the repair shop for five months. And that's just part one. Part two is a "true story that hasn't happened yet." An old man finds his old airplane in England, of all places, and brings it home to Arizona against all odds. The descriptions of the trip come from Dale's research and planning to actually make the trip himself. Imagine trying to cross an ocean in an airplane that, fully loaded with fuel for 45 hours, only weighs about a ton, and can only fly 80 miles per hour in the first few hours after takeoff. Take care of physiological needs before beginning chapter 13, because you'll read the last thirty pages without taking a break. This book is a treasure, stuffed with maps and charts and pictures taken by our intrepid aviators. All of the graphics make the pdf file relatively large. You'll have a true gem, a document with historical as well as entertainment value-- an insight into youthful enthusiasm at the close of World War II, a window on a culture that is foreign to modern "American" understanding, and two gripping adventure tales that will keep you turning the pages at a frenzied pace. Part one benefits from Dale's perspective of 50 plus years since the events, as well as comments directly lifted from Dale's mother's diary, and the detailed log kept by "Jug" during the trip itself. Part two is quite literally fiction built on the foundation of fact-- as Dale calls it, "a true story that hasn't happened yet." Mr Adams, I really enjoyed your book. I was browsing the net and looking for something good to read. I certainly found it. It made my day, several in fact. I even printed it out so I could sit in my easy chair and read it in the cozy lamplight in late evening, or late at night when the world is dark and still. Can I call you Dale? After all, I have just ridden with you in a tiny Luscombe across most of Mexico and the Atlantic Ocean. And ride I did. I think your rendering of this piece (both) was grand. Was it perfect? Maybe not, at least to a perfectionist--but it was spectacular, thrilling, and you made me feel like I was right there with you. HOLE IN THE SKY, by Dale Adams, a 276-page book, comes in a PDF file of 24384K.